80 Minute Game Ltd* is offering rugby mad fans coming to New Zealand in 2011 a home away from home, through its website www.80minutegame.com. 80 MG have employed the services of Wildfire to develop and implement a Social Media Strategy. Social media is an excellent medium of communication for 80 Minute Game; as it is a fast and affordable way of reaching their target audience. 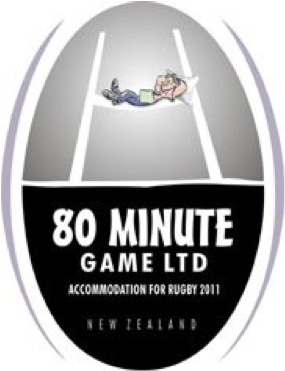 80 Minute Game Ltd has no affiliation or association with Rugby World Cup Limited, Rugby New Zealand 2011 Limited or the International Rugby Board. Any reference to the name of the Rugby World Cup 2011 tournament is made solely in order to assist in servicing the needs of the independent traveller to Rugby World Cup 2011. Under no circumstances shall Rugby World Cup Limited, Rugby New Zealand Limited or the International Rugby Board have any liability whatsoever in connection with accommodation which is listed and/or booked via or through the website.